This cultivar was originated by Dr. Fumio Maekawa of Japan around 1940 and registered by Peter and Jean Ruh of Ohio in 2002. 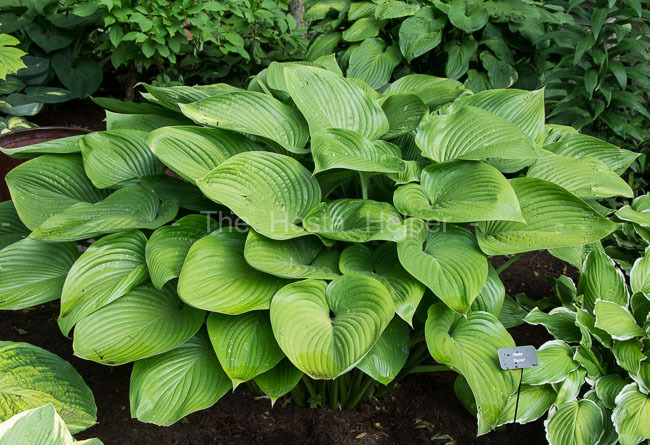 The plant is a giant size (31 to 43 inches tall by 74 to 91 inches wide) hosta with a vase shape and foliage that is very deeply lobed at the base and has a distinct tip. As with most plants of this type, it has thick, slug resistant, substance. The leaves are slightly shiny on top, lightly wavy, lightly twisted and slightly rippled. Near white flowers with lavender stripes are borne on nearly 6 feet tall scapes from mid-July into August. It sets viable seeds. According to The Hostapedia by Mark Zilis (2009), "There is some question as to whether or not 'Elatior' should be considered a form of H. nigrescens. Bob Solberg of Green Hill Farm in North Carolina and others have recently debated this point and I am in agreement that it does not look or act like H. nigrescens itself." 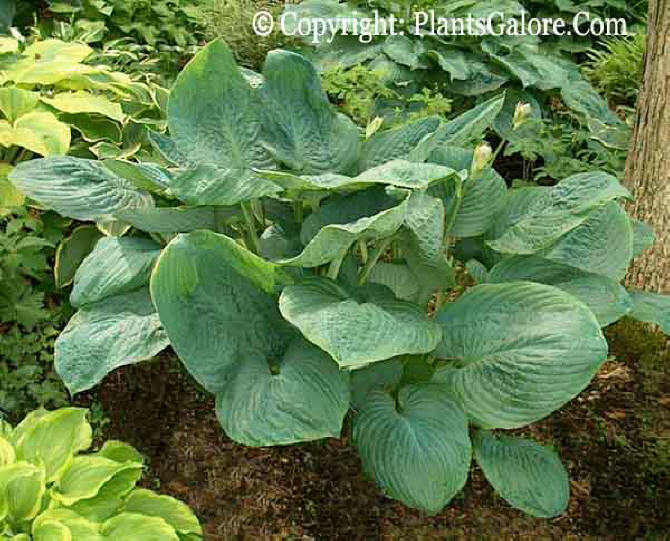 The Hosta Handbook by Mark Zilis (2000) comments, "Though listed as a type of H. nigrescens, it likely is a hybrid. A good guess as to its parentage would be H. nigrescens (tall scapes, large size, upright habit) x H. montana (scape but flowerlike as it unfurls, whitish flower color)." 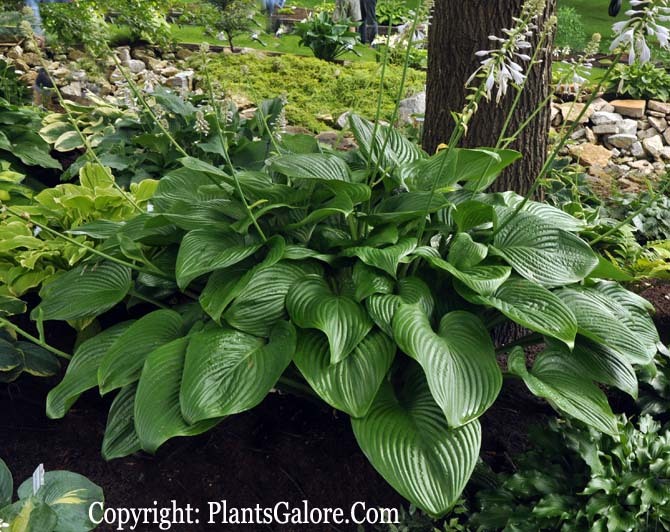 The New Encyclopedia of Hostasby Diana Grenfell (2009) states: "A superb specimen for a woodland setting...The tallest flower scape of any hosta. Small near-white bracts on the flower scape." From the Field Guide to Hostas by Mark Zilis (2014), "As a mature specimen in flower, 'Elatior' can only be viewed in awe...the flower stalks that reach 6-7 feet high or more add a prominent vertical element to any shaded landscape...Likely, it is a cross between H. nigrescens and H. montana, H. hypoleuca or H. rectifolia." An article by Warren I. Pollock in The Hosta Journal (2004 Vol. 35 No.2) says, "...the cultivar that has been known as H. nigrescens 'Elatior' is now named with just its cultivar epithet, 'Elatior'. In other words, no species name is attached...The consensus of hosta authorities today is that 'Elatior' does not have H. nigrescens parentage. More than likely its parentage is H. montana ." An article by Warren I. Pollock in The Hosta Journal (2011 Vol. 42 No. 1) states that, "The handsome 'Victory'...a sport of 'Elatior', has handsome green leaves with creamy yellow margin that fades to creamy white. It too has those exceedingly tall flower scapes; the registration gives their heights as 40 to 70 inches. I am one of those who does not consider the scapes of 'Elatior' and 'Victory' a positive attribute."